Joey Feltman, Food and Beverage Director....SkyWays Motel and Marco Polo Hotel. Mike -- I remember your dad, Jimmy. David Glass was on site owner then. CarlAbbott,my husband, went with your Mom & Dad, Carl & I and Davie & his wife to a big charity shindig at Fontainbleau courtesy of Bennie Gaines -- also an owner, as I recall. Jack Benny & Martha Raye were some of the performers that nite. My name then was Bebe Abbott & you must have played with John & Sammy & Louis. I remember the Skyways in the sixties. My father (Jim) worked there as the Manager. I remember the Hanger Lounge with the Four Bits (nice guys). I would visit there and play with Carl Abbott's sons and David Glass' Grandsons. My father disappeared from the Skyway Hotel in November of 1979. His name was Richard Ruest. Does anyone have any information regarding him or the case??? Does anyone remember the case? Please contact me at daustin@sdkc.com or leave a message. I am trying to get newspaper articles as well as any information. I will never forget Ronnie's. It was first at a hotel at Miami Beach then went to the Skyways. My entire family went. My brother would even get on stage to play the drums. Soooooo many great memories, soooo many friends. I still think of them often. Whatever happened to Ronnie and my favorite waitress Joy. Great part of my life. I remember Ronnie's Lounge very well. I used to work for Eastern Airlines at MIA back in the mid 70's and would go there every Sunday night for a few drinks. Ronnie's had old soda cans filled with un-popped popcorn on all of the tables and everyone would shake those cans in time to the music. I recall back then there was a four piece band that worked there on Sundays called Blue Sky. Does anybody else remember them? They had a female electric guitarist that was fantastic. Ronnie's had old soda cans filled with un-popped popcorn on all of the tables and everyone would shake those cans in time to the music. We always had so much fun running up a huge bar tab and flirting with the incoming flight attendants. Those were the days ! WOW! talk about memories. My mom was a 'maid' (housekeeper) there at the Skyway back in the mid 60's. I was in 5th grade and would go with my mom to work whenever I was out of school or not feeling well to be in school. Mom couldn't afford childcare so she brought me to work. I remember her doing the rooms while I sat and watched TV in a 'check-out' room. I also recalled striking up a really great conversation with a guest about astronauts and why they had to be quarantined when they got back from space. He was actually a NASA engineer. I am 53 now and my mom has passed, but it is nice to visit Memory Lane. love the picture Don..thanks! my parents owned the hotel ( it was changed to a hotel) & we even lived there for a number of years. My Dad, Manny Melamed did own the hotel from about 1974 til 1988 .. 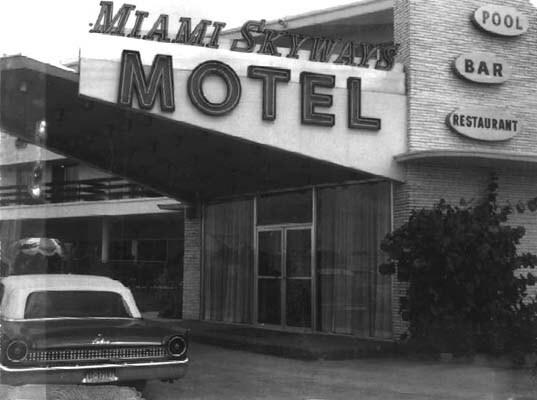 I worked at the Miami Skyways Motel around 1970-71 for a rental car company and we had a desk just inside those double doors you see on the picture. It was a great place to work, the staff were great as well. I am wondering? did a Manny Melamed own the hotel at that time. Jo Anne, thank you for writing and for your memories. Lums introduced Ollie Burgers in the early 70's (or was it the late 60's) as I recall but they were in addition to their regular burgers which could have been called Lumsburgers? Congrats on your long marriage! Can't believe I found this site. Miami was the best in 1968. I was an Eastern Flight Attendent living in the Virginia Gardens Apts..trained at the Miami Springs Villas. I met my husband of 42 years there(yep, still together) ....and we spent many times listening to the Rhodes Brothers at Big Daddy's!!! Wow, I haven't thought about this is years....there was Lums too, was it lumbergers???? Glad the Rhodes Brothers were so successful.... I remember good tunes and lots trumpets!!!!! John, thank you very much for writing in and for your comments. So many people loved you guys and will never forget you. Y'all were part of the many good memories of Miami that people have from the 60's and 70's. Don, I just discovered your web site. So Coooooool. This is John Rhodes of the Rhodes Brothers. So many great memories in that era. I can not express the joy we had during those days. I know every town talks about the old days and how good things were. BUT Miami in those days was without a doubt the talk of the town from New York to LA and everything inbetween. Thanks for keeping the memories alive. And thank you Miami from the Rhodes Brothers. The spirit is still alive. There are far more viewers of the gallery pages than one individual photo like this one in a gallery. Does anyone have a photo of the LeJeune Drive In formerly on LeJeune Road? I also remember Ronnie loved Disney world, and would organize group trips there. D.C. In addition to the good food, they use to host the Professional Wrestlers that would come down to wrestle at the Miami Beach Convention Center (Florida Championship wrestling). Ric Flair, Kevin Sullivan, Andre the Giant-All the Greats were there. I remember Roberto Durran use to party at Ronnies back when he was at his prime. My first time in Miami was in '83, due to a missed connecting flight at the airport. The Airline put us up at the Skyways Motel. I still have a t-shirt from the "Ronnie's at the Skyways" lounge. Wow, what memories! My mother and I both worked at the Skyways in the early 70's. I don't remember the Rhodes Brothers, but when I saw one comment regarding the Four Bits a light came on! They had a female drummer that did an amazing job on the drum solo for Wipeout. Those were the days. I worked at Ronnies Lounge in the late "70's ... I believe Ronnie's last name was Leonard. Does anyone know the last name of Ronnie who ws at the Skyways in the 70s? He called it Ronnie's Lounge. Guest, thanks for the update on the brothers. I saw them perform a couple of times in the 70's at their club at the Merchandise Mart and everyone had a great time. Let us know when your site is up so we can give you a link on this site. The Rhodes Brothers are alive and well with the exception of Ruey Rhodes who passed away too young in 1984. John is my father. He recently moved to the Charlotte NC area. My uncle Tom is living in the Deland FL area and uncle Eddie is living in Miami. It's been a couple of years since they have done a show, but they are still involved in music. Some older albums can be found on eBay. I have been scanning old photos and newspaper articles that I hope to post on a Rhodes Brothers site. I was a little kid that used to run around the Merchandise Mart back in the early 70s. Great times. Can anyone tell me the name of the club in South Daytona that the Rhode's Brothers are singing at????? I'm trying to locate them, my sister used to go every week to see them in Miami and her 60th Birthday is coming up and I'd like to surprise her. eddie is managing a moose lodge in kendall somewhere! i lived with the eddie tom and john 4 about a year while they were the F &B manegers and i was managing the restaurnt while they were putting on shows at the miami springs golf and county club! Sure, if you have it scanned send it to me via e-mail (OldMiamiMemories@gmail.com) and I put it up. Thanks! I found a 1975 Rhodes Brothers EXPO DOLLAR from Lauderdale. Would you like to post the pic? My parents loved the Rhodes Bros! I remember them getting dressed up and going to see them when I was a kid...i thought it was all so glamorous! I wish I still had their records! John Rhodes is ALIVE & WELL! He recently opened a pub on US1 in South Daytona, and is singing there! Very cool! I worked the door and bar at the Rhodes Bros club in the middle 70's.They were the very best. Check the Elks club on sunset and 107 ave. They occasionally perform there. I've also seen them perform at the golf course (country club) on Curtis Pky in Miami Springs. As a kid, I grew up with the Rhodes Brothers across the street from me in Columbus, OH. They moved to Coral Gables toward the end of the 60's. We used to go see them perform. Do you know if Tom, Ed or John are still alive? Are they still in the Miami area? The Skyways was home to Ronnie's lounge in the 70's & 80's. I WORKED WTH THE RHODES BROS. AT THE CARILLION HOTEL, HAVE THEIR AUTOGRAPHS AND PICTURE. The Rhodes Brothers opened their own club in the Miami Merchandise Mart back in the early 70s. It was huge and always packed. Their show was awesome - very talented guys. The Briarwood Singers used to sing here too, and the Impact of Brass. Bebe - The Skyways was right across LeJeune from the Airport. Its various facilities were given airport related names -- the Hanger Lounge, the Runway (walkway to lounge.) Eastern stewardesses in training stayed there. How could one forget the Four Bits or Phil Reudy or John LaSalle performing in the Hanger Lounge? The bowling alley was at the Crossaways Airport Inn across the street on LeJeune Road about a half mile South of where the Miami Skyways Motel was. I KNOW I'm correct on this one Don. All of these buildings are gone to make way for the new Intermodal transportation center. I remember seeing the Rhodes Bros. at a Miami Beach Hotel in 1971 or 1972. Can't remember which one. The bowling alley was the Airport Lanes. Guest, Yes, there was a bowling alley/ pool hall in the back. I too have forgotten the name... Anybody out there remember?? How about the Rhodes Brothers, they were there for years and very good. I think this is where The Miami Sound Machine and Gloria Estefan got their start!! Wasn't there a bowling alley, forgot the name, in back of this motel?